Woodland Scenics Realistic Water allows you to model still or slow-moving water, such as ponds, rivers, lakes and more. 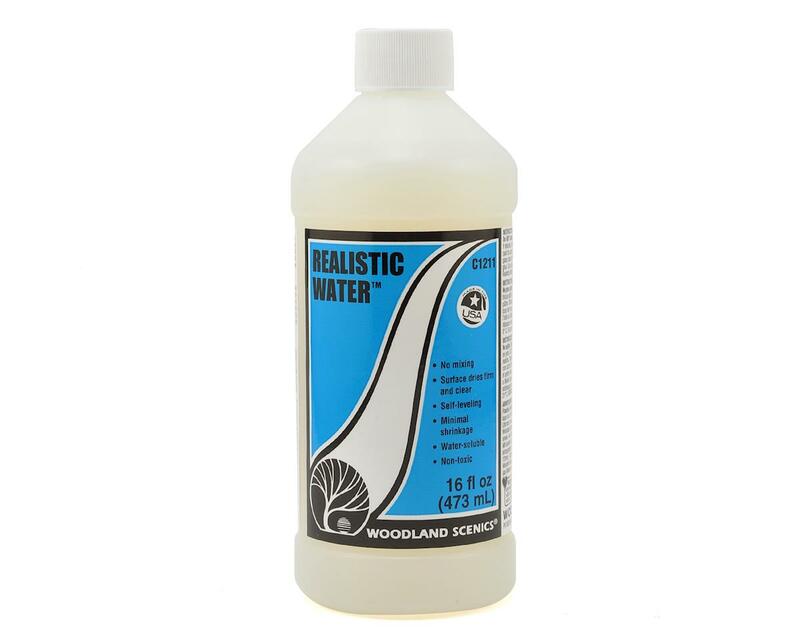 Pour directly from the bottle, Realistic Water is self-leveling. Pour no more than 1/8” deep. Dries clear in approximately 24 hours and the bottle covers an area 17” in diameter when poured to the recommended depth of 1/8”. Recommended maximum layer depth of 1/8"
Woodland Scenics Underbrush Shaker, Forest Blend/50 cu. in. Woodland Scenics Coarse Turf Shaker, Conifer/50 cu. in. Woodland Scenics Clump-Foliage Bag, Medium Green/165 cu. in. Woodland Scenics Fine Leaf Foliage, Dark Green/75 cu. in. Woodland Scenics Fruit Bag, Apples & Oranges/1.5 cu. in.